WASHINGTON, D.C. — A full-scale revolt against House Speaker John Boehner—including a looming resolution that could come up for a vote at any time that would remove him from the speakership—has thrown into disarray the House GOP leadership’s previously carefully laid plans to push President Obama’s nuclear arms deal with Iran through Congress without a fight. Amid a rebellion in the House GOP conference meeting on Wednesday morning, leadership canceled a previously scheduled rule vote that would have set up the House putting through a resolution of disapproval of the president’s Iran deal under the terms of legislation previously signed into law from Sens. Bob Corker (R-TN) and Ben Cardin (D-MD). This all happened as a result of an argument furthered by Reps. Mike Pompeo (R-KS) and Pete Roskam (R-IL) that Congress shouldn’t even vote on the Corker-Cardin resolution, either approving or disapproving of the Iran deal, since the president has not yet complied with the law regarding the release of text of the deal including “side deals” cut with Tehran. Politico’s Jake Sherman reported midday on Wednesday about a new plan cooked up by House leadership that he later reported via Twitter that Pompeo and Roskam say they support. 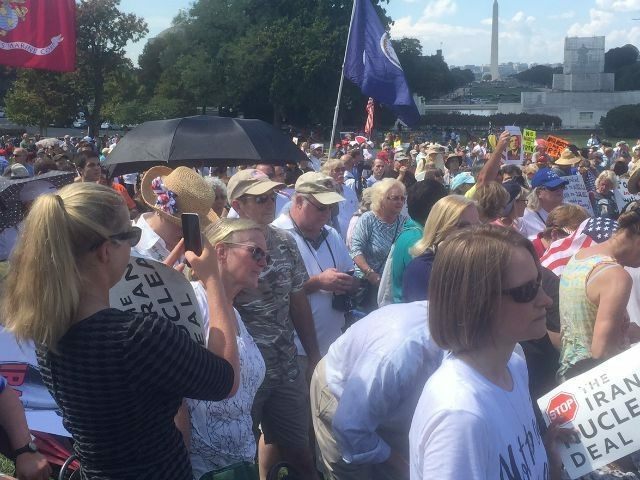 This came after a wide scale full rebellion by House Republicans conference-wide—with five thousand Tea Partiers rallying on the West Lawn of the U.S. Capitol—against Boehner’s push on this matter alongside 2016 GOP presidential frontrunner Donald Trump, fellow candidate Sen. Ted Cruz (R-TX), former Alaska Gov. Sarah Palin, and several other top conservatives on the hill. “Barack Obama clearly has violated the statute that he signed just a few short months ago that requires the president to submit to Congress all Iran-U.S. agreements plus all side agreements with third parties, which includes the International Atomic Energy Agency agreement which is critical to the verification of whether or not Iran is complying with the terms of the agreement or not,” Rep. Mo Brooks (R-AL) told Breitbart News while backstage at the rally. I think that is a reasonable argument to not have a floor vote on the agreement itself until such time as Barack Obama has communicated to the United States Congress, as required by law, all the pertinent information in those side deals. If Barack Obama does not submit those materials, then under that very same statute it is a violation of the law for Barack Obama to relieve the economic sanctions that are on Iran. If Barack Obama does relieve those economic sanctions in violation of the law, then I believe he sets himself up for having committed an impeachable offense. Former Rep. Michele Bachmann (R-MN), who came to Washington to appear at the rally, agrees that Obama would be putting himself in the spot of committing an impeachable offense. Bachmann predicted serious consequences for Republicans if they don’t successfully block the Iran deal. “They could lose majorities in both the House and Senate,” she said. That’s what I think. People are fed up with sending people here who don’t do what they said they were going to do. They need to wake up quick. This is so consequential—that’s why Boehner needs to tell the American people what the law says, declare victory, and then point to the president, put him on his heels. ‘You can’t just fundamentally transform the United States. Now you’re trying to fundamentally transform the entire world? We’re not going to allow you to fulfill the goals of Islamic jihad. I also think Boehner and McConnell need to urge the president to take military action and remove the military hardware as soon as possible to ensure they never get the nuclear weapon and to ensure peace. Rep. John Fleming (R-LA), in a phone interview on Wednesday evening after a subsequent 4 p.m. GOP conference meeting wrapped, broke the whole thing down for Breitbart News. “As you know we met this morning and they presented to us pretty much a vanilla plan that we would go forward with the Corker bill, we would vote on it, we knew we would lose,” Fleming said. We would pass the disapproval in the House but we would lose in the Senate—it would be filibustered in the Senate—so many of us weren’t happy about that. I voted against the Corker bill to begin with, I thought that was the wrong approach. Mr. Pompeo made a really good argument, and he didn’t like the Corker bill either. He talked about what a problem it was, and in the end after a lot of people talked about problems with it, Mr. Roskam asked for a privileged resolution to vote on his bill which was basically a resolution saying the president had never met his obligations to provide all the documents. If you look at the language in it, it says all the documents. Not some of them, or just the ones we know about, it says all of them—all of the agreements with all of the parties. Also, the Speaker and the leadership team got a real sense that if they tried to bring that—the rule—up for a vote today, which was planned at 1 o’clock, that they would fail. So what happened was they went back and talked to Pompeo again and brought Roskam in and talked and even threw in some more ideas and what they came back with was something completely different which I really like. Fleming explained the new plan, which conservatives forced leadership to adopt. “First of all, there is a resolution—or sense of the House—that the president did not meet his obligations by providing all the parts of the agreement that he should,” Fleming said. Fleming said he got the sense that even Corker bill supporters would go for this new strategy, and that it looks like it may be successful. Fleming added, though, that leadership pulling the rule vote is “huge” in the context of the long struggle between conservatives and moderates in the party. “I think it means that people who opposed this approach, which I think was primarily conservatives—I don’t know how much of that was just the Freedom Caucus but I can tell you that much of the Freedom Caucus was prepared to vote against the rule,” Fleming said. But I would tell you that there are a lot of other people, some conservatives and some not conservatives, who were prepared to vote against the rule as well. I think that this was a moment where we were going to vote on something with such tremendous gravity and we were going to vote our conscience and that meant to vote against the rule. Voting against the rule means voting against even having a vote on Corker because at the end of the day it would only end up being perceived by the public as a rubber stamp by Congress and that means agreeing with the president that it is the right way to go. I’ve been challenged on that—people say how is the failure of a disapproval an approval by Congress? I tell people that the only thing our constituents are going to know about is this is the president’s plan and it’s terrible. It’s worse than I think anybody could have imagined. Congress had a bill to stop it and they failed to stop it—therefore they must have approved it.